Learn how to use your crockpot to make a healthy, easy, and nourishing vegetable broth that is vegan and gluten-free. I promised to let you know how my homemade vegetable broth turned out in the slow cooker as part of my preparations for my surgery next week. I’m pleased to report that it turned out amazing! All I did was take a bunch of vegetables and cook them on low for 12 hours overnight. I used onions, carrots, celery, and fennel. I had two containers like this, so I froze one that I will take with me to the hospital and I’m using the other one this week for soups. Just a note, if you have a smaller slow-cooker, just adjust your water to vegetable ratio. Also, I know a lot of people use vegetable scraps for their broth, but I often forget to save scraps when I’m prepping foods so I chose to just use fresh vegetables instead. I hope you had a happy, healthy weekend. It was fun for me to get out of the house and do something different. I actually had a good solid 3-4 hours yesterday where I didn’t think once about my surgery or the whole cancer thing, but, instead, I enjoyed the moment and how beautiful life can be. 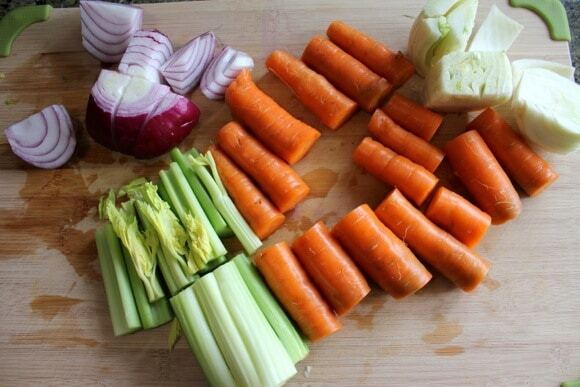 Learn how to use your crockpot to make a healthy, easy, and nourishing vegetable broth. Combine all ingredients in a large slow-cooker and cook on low for 12 hours. Use a ladle to separate the liquid from the vegetables when finished and discard the cooked vegetables. 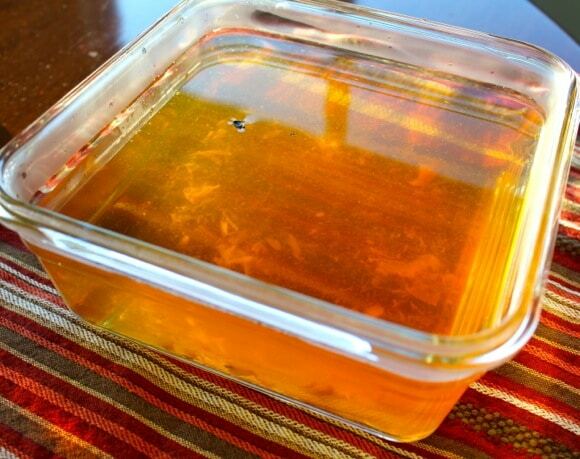 Broth can be frozen for later use or kept in the refrigerator for up to 5 days. I will have to try the vegetable broth. My slow cooker is out from making your applesauce (which turned out very well!) and ready for something else LOL. I have always wanted to go to Hearst Castle. When Bonnie and I were in SLO we didn’t realize how close we were or we might have driven up there LOL. Hi Robyn! You def need to come back to SLO and visit Hearst Castle. If I am here the next time you visit, you can stay with me! I’m glad you apple sauce turned out well. Let me know what else you make in the slow-cooker; I am always looking for inspiration. I am so glad you were able to think about something else and relax a little bit. 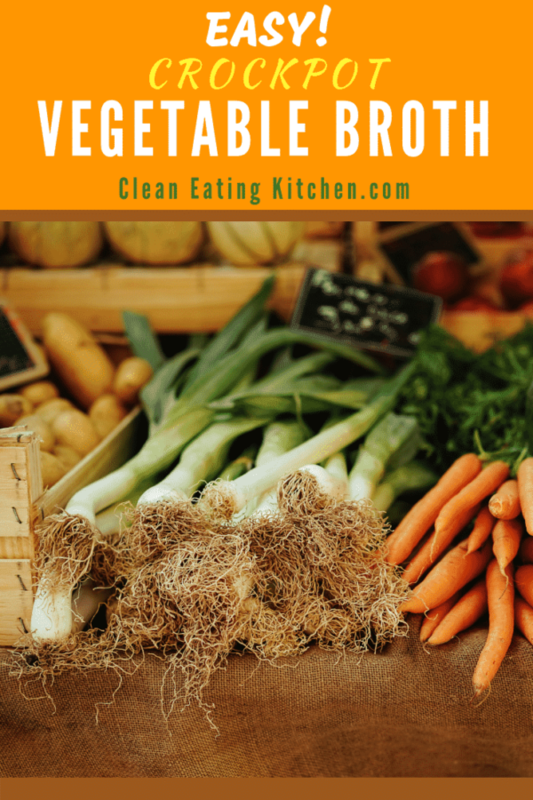 About your broth, what do you do with the veggies that you take out? I put mine in the Vitamix and puree them and then add them to pasta sauces or to other soups to make them a little richer. I hope you are still planning to attend Immersion! I look forward to meeting you. Thanks for that recipe. I am just starting to use a slow cooker for my meals and am very excited about all the great recipes there are out there. I was down in Santa Cruz last Saturday enjoying the nice and isolated beach. It was actually warm and sunny. I have passed by Hearst castle twice now but I need to actually visit one of these days. It sounds like an amazing place. I used to make my “green” soups every month. The leftovers were put in the freezer. I always knew that I had healthy food in the freezer whenever I come home and was too tired or lazy to make something to eat. I also brought it to work for lunch. All I had to do was put it in the microwave for a few minutes to warm it up. It was simple, healthy and delicious. I stopped making the soup. I just got lazy. No good excuse. 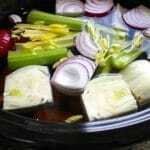 What a lovely veg broth recipe! I’m going to try to make it in our pressure cooker since I don’t have a slow cooker or crock pot. And your vitamix soup fascinated me! Almond butter, veggies n soy milk – what a combo, really excited to try something similar. Thanks, Nicole! Let me know how your pressure cooker broth turns out. One of my big to-do items is to start using my PC more. Oooh Hearst Castle is on my to-do list. Looks beautiful there! I have to admit I normally can’t be bothered to make vegetable broth, but would love to start getting in the habit. A friend of mine saves her veggie “leftovers” for the week (carrot tops & peelings, celery tops & ends, onion tops etc) and cooks it up at the end of the week and freezes it in an ice cube tray. What a beautiful place to visit, I love the pics that you shared. I prefer to make homemade broth, just more comforting to know where the veggies came from 🙂 I love your homemade soup idea so packed with goodness! Thanks for the broth recipe. I keep meaning to make a veg broth to freeze, since I can never find any no-oil, no-salt, organic veggie broth. 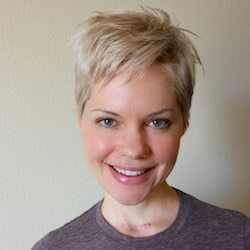 My mom reads your blog (she and I are both vegan/nutritarian, as are my kids) and mentioned your cancer diagnosis, so I wanted to say I’ll be praying for you and sending you positive energy. I’ll bet you’re the healthiest person they’ve ever operated on — I’d expect you to have a really good recovery. My mom had an emergency surgery a couple of years ago and the doctor was amazed by how well she did during the surgery (I remember him saying she hardly had any bleeding) and how quickly she bounced back. Thank you so much for your sweet and encouraging message, Carrie! I am really hopeful that my healthy lifestyle will benefit me post-surgery and hopefully prevent any new cancer from forming! 🙂 Hugs to you. I am so glad I found you on Dr. Fuhrman’s website, you are such an inspiration to me. I will be sending you as much positive energy as I can muster for your upcoming surgery on Monday! Tell Alan I will include him in my prayers to the universe too! Thank you for this broth recipe and the beautiful pictures sure do help. You must have a gigantic crock pot as I have the broth cooking right now and it is FULL to the brim! I have never cooked broth in my life, but there is always a first. The trip to Hearst Castle looks fabulous and all the beach pictures look divine. I envy all of you in California, especially those close the beach. I grew up in Ft. lauderdale, Florida but have now lived in Texas for 30 years. Your pictures bring back such wonderful memories. Take care Carrie and a big Texas size hug to you! All your many friends on your website have you in their hearts and in their prayers. Hope all goes well and you are back here, posting away in no time at all! Thanks, Perrie! I can’t wait to blog again, hopefully in the next day or so. I just stumbled across your blog while doing some recipe googling and here it is…2 hours later and I’m still reading your blog 🙂 You are such an inspiration and exactly what I need to be reading about! I have tried making veggie broth on the stove and it came out so bland, I never gave it another try. 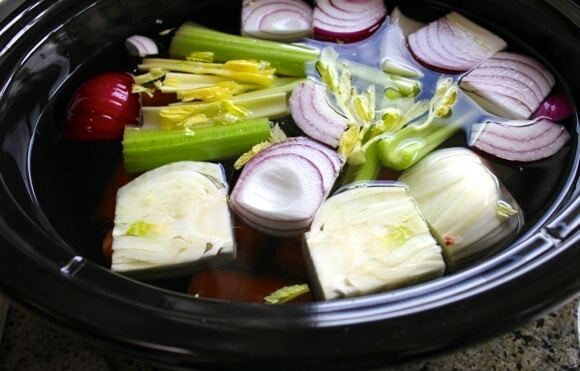 I love love love my slow cooker, so I am definitely going to give this a try. I think the extra 10 hours of simmering will do a world of difference. Thanks so much for all your work and know that you are appreciated!!! Thank you so much for all of your wonderful recipes. I am constantly on your site. This broth recipe is perfect. I’ve got my second batch in the crock-pot now! Yay, I’m so glad you like this recipe, Danielle! I’m going to start making this again now that the weather is turning cool for fall. What other kinds of recipes would you like to see?